Dog Sledding: What is it all about? It started out as a surprise outing. I had not planned or looked up anything about the tour; I had no idea what to expect. 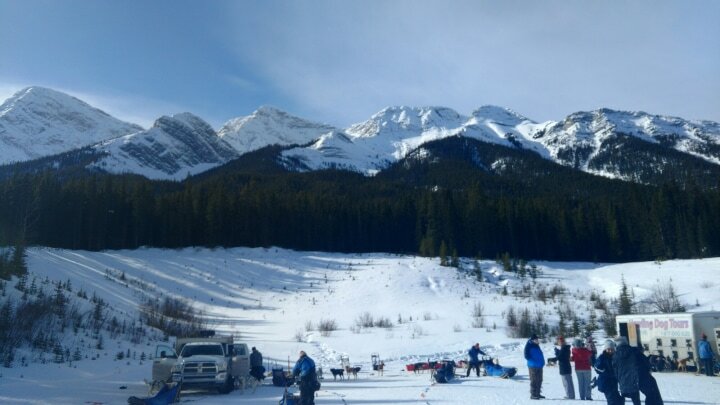 We arrived at the pick-up location in Canmore. They got us to sign forms and checked everyone in. At this point they also made sure we had proper winter clothes and we knew our driver. As I was pulling on my Helly Hansen snowsuit our driver came over mentioning that I may get warm in the ride up to Spray Lakes. I questioned him if the snowsuit was overkill for the day and he laughed saying that it was better to be able to wear too much and layer down than not enough and be cold. We then all piled in to our van and made our way up the winding road into the mountains. Once at the staging site we got the run-down of our adventure and what to expect. 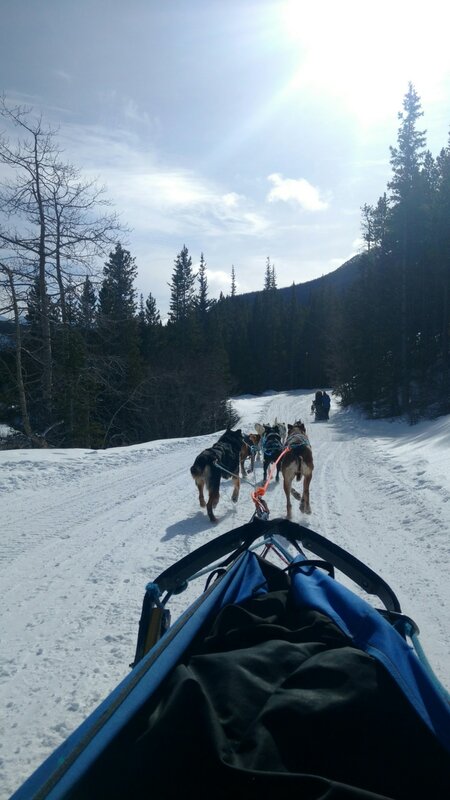 I was happy to know most of the dogs are rescue dogs, veteran racing dogs or dogs that were not cut out for other sledding teams for some reason. Howling Tours worked out the kinks in the dogs and every dog we met was friendly. A few were shy but warmed up to us quickly. We met our team and helped get them.on the line ready to run. 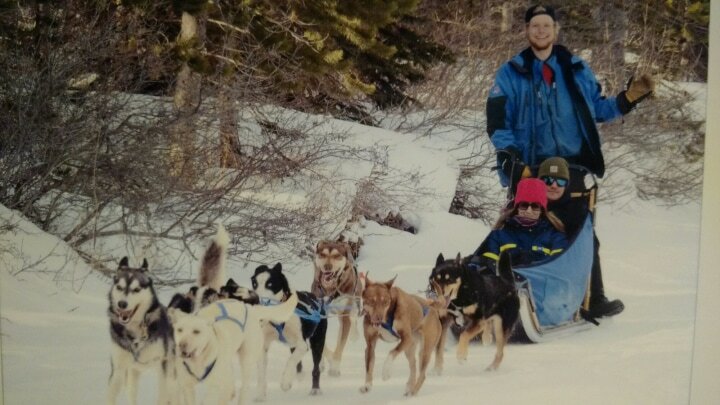 I sat on the sled while Vince held the line for all the dogs to be put on. The dog were all excited and were ready to work. On the trail we could stop for pictures, change places so we could “help” mush. I don’t know how much help our dogs needed getting up the hills but I never seemed to do much when I was standing behind the sled. We stopped for hot chocolate and cookies. The dogs got lots of attention and they all were complaining about not running. Eighty dogs all barking at the same time was very loud. They know their job and just want to pull the sled. Back at the staging area we were able to give each of our team treats along with water. Every dog had a distinct personality and were very lovable. Last but not least was our excellent tour guide. He was knowledgeable and entertaining, telling us stories about the dogs and sledding along the way. Leaving with tons of pictures and a great memory was worth every minute of our tour.